Breakage of skin around finger and toe nails is often painful and itchy. 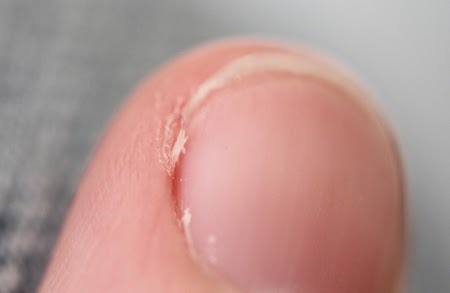 It usually happens due to the cuticles over dryness and nails bitten. The section of thin skin has been usually separated from the cuticle and the skin become cracked and broken. Sometimes several fingers affected each time and this condition usually lasts for 1 or 2 weeks with a painful, sore or bleeding if not treated.To treat this inflammation and infection now needs to better care for your hands and feet skin to get rid of this infection. In a serious condition you must consult a dermatologist or physician to treat better. We recommend some useful and good home made tips to treat this condition. Mix 1 tablespoon Almond Oil, 1 teaspoon glycerin and 8-10 drops of Lemon juice. Keep this mixture in a bottle and apply it daily on your affected finger before going to sleep with a little massage. Within 5-6 days your finger nails and skin become smooth and fine. Take 10 grams Petroleum jelly and mix Penicillin injection dry powder in it. Mix it very well and use it daily before going to bed. Wear to cover your hand and feet with gloves and socks overnight. Within 2-3 days your very deep painful cracks will remove. This tip is also best for cracked and painful heels. Mix Borax powder (Suhaga), Glycerin and lemon juice in equal quantity. Apply it daily 2-3 times during the day for 4-5 days for fast and best result. Make a paste with Papaya peel off and apply it daily on cracked skin around your nails. Best to treat cracked skin inflammation and cure your skin from infection. Slightly rubbing Lemon peel off on the affected finger area also found very effective to treat this infection. Dip a cotton swab in Pineapple juice and rub with it on the affected area. Leave it to dry for 15-20 minutes. Vitamin C in its best healer for inflammation and cracked skin. Mix 1 teaspoon Olive oil in 1 cup milk and soak your finger in it for 25-30 minutes within 3-4 days cracked nail skin becomes normal. Keep your skin from dryness and dehydration. Eat plenty of fruits and vegetables and choose water instead of sugary beverages. Avoid using harsh soaps and wear gloves to protect the nails while washing dishes or using cleaning chemicals. Always soak hands to soften the skin before trimming or filing. Gently push back the cuticles with the aid of a manicure stick.